Lindsey Hunter being interviewed for a local newscast. When we think of extraordinary moments in film that have lifted our hearts, opened our eyes and moved us to take action to better the world around us, it brings to mind that famous quote from Bergman. Picking up on that narrative, I had the pleasure of interviewing a young filmmaker who is shouting a loud message of acceptance through her main character, who is a young, deaf girl. I spoke with Lindsey Hunter, a young teenager from Northern California, who used a handmade, DIY shoulder-mount and a pair of Nikon lenses to tell such a beautiful story. 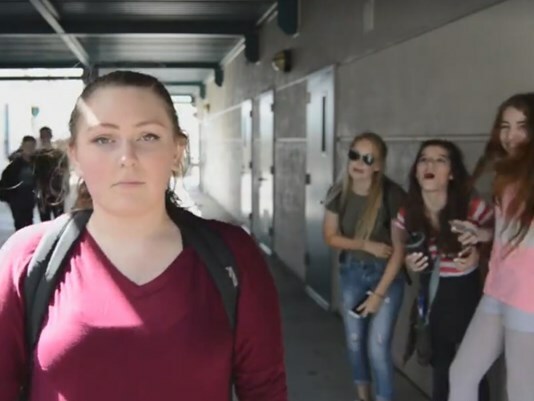 Lindsey is 16 years old and not deaf but that didn’t stop her from – one year ago – making the short film Silent that tackles the sensitive subject matter of teen bullying. What started out on a whim (for a school film contest) – then manifested into reality – Silent is the type of viewing experience where tissues should be tucked nearby when one clearly sees the undeniable power of kindness for the disenfranchised and forgotten. After five days of shooting in nearby neighborhoods and classrooms, Lindsey’s father, Richard, did what any proud father would do: He put the film out and into the world…by sharing it on his daughter’s school’s Facebook page. In just twenty-four hours, Silent gave a voice to the masses and racked up an astonishing 100,000 views. Silent – the anti-bullying statement where more than just words have power – became a viral sensation that would also nab earn several prestigious honors (1st Place, Northern California Media Educators; Official Selection, All American High School Film Festival; Official Selection, Tower of Youth Film Showcase); garner Lindsey press coverage from multiple media outlets; and be shown in school assemblies across the country. Silent is also Lindsey’s very first attempt at filmmaking. The film is a master exercise in subtlety from the aforementioned statement that closes the film to the artistic choice of excluding all dialogue – save the film’s score that speaks volumes on compassion, grace and humility. All of these admirable components make up the span of a mere five-minute film. “In a deaf person’s world, their world is completely silent,” adds Lindsey. By giving a voice to the voiceless, it is no wonder that the young teen is well on her way in using her gift as a platform for social awareness, real change, and hope for those who don’t know where to find it. In the interview below, Lindsey shares every aspect of what led to creating a short film on teen bullying. From getting a crash course in filmmaking via YouTube videos and getting hands on experience in specialty classes (mainly for adults) to building her own shoulder-mount and writing a first-time script with no dialogue, this is one story that will remind you that it’s never okay to remain Silent. 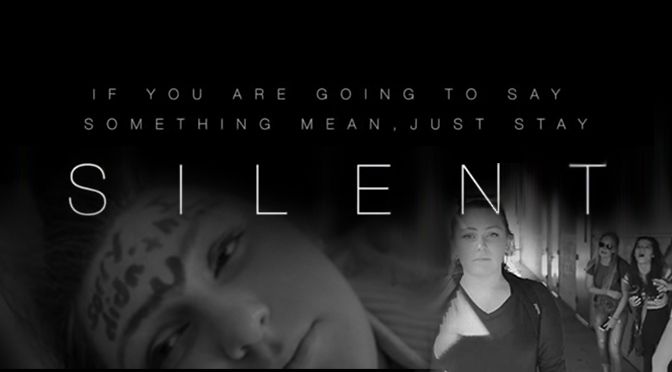 NR: Can you tell us the premise of Silent and how your short film tackles teen bullying? LH: Silent is about a girl who is bullied for being deaf by these three girls at her school, and over the course of the film, you see one of the bullies change her perspective of the bullying. The bully actually tries to befriend the deaf girl. NR: With the bullying culture, especially online, it’s become even easier to attack others. As a young teen, do you believe teen bullying is getting worse? LH: Yeah, just recently at my school there was somebody in a special needs program, and they were bullied when someone urinated in the water bottle a special needs student, and that was just this year. I’ve seen that all over social media. When I see bullying, I try to do something about it, or talk to the person who’s doing it to make them stop. But with social media, it’s really “helped” bullying because it has this attractiveness of you being able to hide behind a screen and share what you think instead of seeing their [the victim’s] actual reaction, their actual face, and see what’s it it’s actually doing to them. Some people have said, “stuff in Silent doesn’t really happen,” but obviously some bullying experiences are much worse. NR: With this being your first film at such a young age, how did you conceptualize such a short film about teen bullying? LH: With my dad being blind, I’ve been raised around people with disabilities, and so I really feel compassion towards them. I work with them at my church in the special needs program, and so I knew I wanted to do something including awareness of disabilities. Teen bullying is such a big problem in today’s society, so I wanted to put them together. It all started in Olive Garden and I was pitching my ideas to my “creative team”, or my family, and they were helping me develop the story, and then I went back and developed it fully. There are a lot of films that focus on “you have stop bullying” and focuses on the bad effect bullying has, but Silent has a different message with a positive end. It focuses on being compassionate and loving towards other people. NR: The name of the film implies there is no dialogue. That being said, can you walk me through the process of writing a script for Silent? LH: It wasn’t really a script, it was more of planning out all the scenes and exactly what I wanted. With the different visions I had, I would lie at night and listen to different music and picture exactly what I wanted and would then write that down. I had my shot list with everything I wanted to see, and every emotion I wanted to see. I would carry that around during filming and I would just check off my list what I had done. NR: As a budding director working with young actors, are you involved in theater? LH: Yes, in my spare time, I would go to El Dorado Musical Theatre (EDMT) and perform in their musicals. Just recently, we just got off the run of The Wizard of Oz and I played one of the Wicked Witches. The actress who portrayed the deaf girl, Jocelyn, played the other wicked witch, which was really fun. Musical theater has really helped with the development of my directing ideas and how I direct. Debbie Wilson, who is our director, helps us develop our character and helps us to play it on stage. We write a backstory for our character and we have to know exactly where “we” came from, and where we’re going after scenes. So, I try to incorporate that in my directing, so that it comes out on the screen. NR: How many days did it take to film Silent and what was your “budget”? LH: We started filming on Super Bowl Sunday ; they [the actors] came right before the game and filmed about two hours with me. We had about five days, one being a re-shoot day. Then, I had about five hours or more of editing to do. I didn’t spend any money on wardrobe, make up or locations. All the money that I had was for buying equipment. The only equipment I owned during Silent was my Nikon D3200, with the lens it came with. Lindsey Hunter with her “DIY” shoulder-mount used in Silent. NR: The film’s message regarding teen bullying and your “DIY” attitude is amazing. 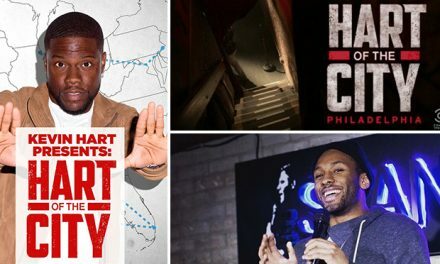 This sounds like a crash-course in filmmaking? LH: It was a completely new experience, and doing a Media I class really helped with shots, angles, and different techniques to show various emotions. Silent was a result of what I learned in my first year of film class. NR: Did you use YouTube for any online tutorials? LH: I love the Dutch angle technique, and so I looked up how to do that and I actually practiced on a teddy bear (laughs). NR: In addition to your high school class and YouTube, did you have any other additional outlets to help you? LH: Yeah, my mom would drive me down to Access Sacramento. I was very grateful to have her drive me there, because I learned so much: how to work a more expensive camera, rack-focus, lighting and how to work with sound that’ll help carry me into my next project and beyond. I was the only kid in the class (laughs). NR: You also employed sign language instructors. Can you tell me about that? LH: The main sign language instructor is actually the mother of Jocelyn, the deaf girl. I would ask her how to say certain things in sign language, and then she would teach Jocelyn, who would then teach our actors. Our sign language instructor, Kelly, can actually be seen in the classroom scene, “signing” with the math teacher. It was meant to be…I guess you could say. NR: I read that Jocelyn, the actress who’s a victim of teen bullying in Silent, is not deaf, correct? LH: Correct. Jocelyn is not deaf. NR: “If you’re going to say something mean, just stay silent,” is a powerful message. Did you come up with that before or after filming? LH: It was kind of during the process, and I was seeing how it was unfolding. I definitely wanted a message at the end and all I could think of was the saying, “If you’re going to say something mean, don’t say it at all,” because that’s such a true statement. So I changed it to relate directly to Silent. NR: Tell us how Silent went “viral”? LH: My dad sent it to my school district, FCUSD, who then posted it on their Facebook page and within a day, it had 100,000 views, and it just started climbing from there. And from a girl who never had a video reach over 500 views that was incredibly crazy for me (laughs). Some of my fellow media students were trying to get a hash-tag started to get me on Ellen. I would be walking around school and people would tell me how they loved Silent and how their parents were in tears after seeing it. When I saw Silent, I only saw the mistakes. But as it started going viral, and I started seeing the comments on Facebook, I saw how much of a difference it was making, which blew me away. I see a bunch of comments of people telling their own bullying stories and how Silent affected them. A bunch of parents also were talking about how real this situation is and how excited they were to see someone bringing this topic up. NR: How many views has Silent racked up across social media? LH: On my school’s Facebook page, it has about 600,000 views; on my YouTube, Acorn Productions, it has about 16,000. NR: You’ve mentioned Silent is also being used in school assemblies when discussing teen bullying? LH: We received a lot of messages from teachers and principals, who said that they were playing Silent in assemblies to bring awareness, and even playing it at my school for education purposes. 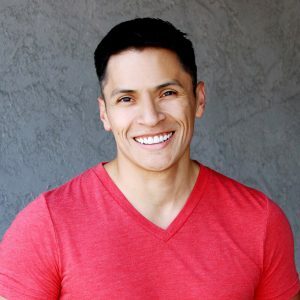 I was actually called to a classroom with Jocelyn, where they all [the students] wrote me letters, expressing what they felt about Silent and their personal experiences with bullying. I’ll never forget this, a girl comes up to us at the very end of class, and gives us both a big hug and says, “It was my dream to meet you today,” and that just broke my heart that somebody said that to me. NR: In addressing the sensitive subject matter of teen bullying, did Silent show you the power of story telling and making an impact? LH: It really opened my eyes to a world where people can learn something from movies. Before that, you go to the movie theater for entertainment, that’s what I thought. But when Silent came out, I realized, film can inspire people to change and make such a difference in somebody’s life. It really opened my eyes. I was actually part of a film jury for Tower of Youth North American Film Showcase, and we got to watch films from all over the world about people tackling topics that Hollywood rarely tackles. And that inspired me to my next film called, Hey Sarah and my senior project, which touches on human trafficking. My dream is to do my full-length film of my grandmother’s story from growing up in World War II because it has a message that touch people and can change people. NR: What advice would you give to kids your age who want to share their story? LH: I would tell aspiring filmmakers to create stories about something they’re passionate about, because it will definitely show on the screen. People will be able to feel what you feel. You have such a wide variety of subjects you can tackle and change the world with. I started with an iTouch and here I am with a DSLR, but I could get the exact same emotion and exact same message in a film made with an iTouch as I did with my DSLR. Make sure you’re still having fun and don’t worry about what other people think about you. Just recently, Lindsey Hunter continued to educate both her peers and adults on teen bullying at the CARS+ State Conference for California Special Education Teachers, proving that Silent’s message is louder than ever.